This was more of an adventure than just a road test. 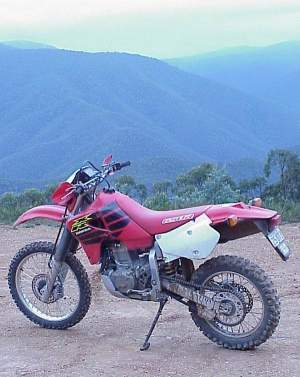 The XR650 was up to the challenge much more than I. The hill climbs were incredible and seemed to go on forever. The tractor like pull from the new 649cc engine was what got me up to the top of them, not skill, not luck, just masses of low speed pull in any gear – available everywhere in the rev range with no pinging or protesting of any kind from the drive train. 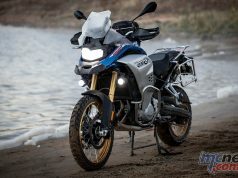 That is not to say the 650 lacks a top end – it doesn’t. It loves to rev and doesn’t tail off like its XR600 predecessor. The de-restricted XR650 with competition baffle is good for around 50 rear wheel horsepower. Torque is also prodigious. (Dyno charts will be up later this week). De-restriction is carried out by removing the air intake snorkel and additional plate in the rear of the airbox. The rubber manifold between the carb’ and cylinder head is replaced with the unrestricted manifold that is supplied with the bike. The standard muffler baffle can then be replaced with the competition item that is available from Honda dealers for around $260. The standard jet is a 112. The supplied competition jet is a 175 but this was thought a little rich for our test bikes so we ran with a 162. Pilot remained the same and the mixture screw was set 2 turns out. The starting process is carried out by way of a kick-start lever that has a built in safety mechanism to prevent any injuries from kickbacks. A breakaway bush is mounted at the base of the kick-start lever that actually slips if severe back tension is experienced. The XR650 has a camshaft actuated de-compression system that works quite well and with the improved kick-start ratio makes for easier starting than the XR600. The carburettor looks similar in appearance to the XR600 but is very much a changed unit. It has a 40mm bore and provided us with perfect carburation, surprising given the extreme altitude changes we were putting them through. I never stalled once even with the very low speed manoeuvring that was needed to overcome some of the obstacles. This speaks volumes for how well the fuel delivery system worked. The carb’ is fed from a 10-litre fuel tank which includes a 2-litre reserve. Fuel economy should range between 100 kilometres (going hard) and around 170 kilometres (going slow). One of the guys managed to dunk a XR650 in one of the 30 or so river crossings we negotiated. The bike was retrieved and the air-box inspected to reveal that no water had found it’s way in to the engine whatsoever. A few kicks with the ignition turned off cleared out the unburned fuel, and then she fired up quite quickly to everyone’s surprise and relief. A similar automatic timing chain tensioning system is used as that on the XR400. The camshaft has 3 lobes, 2 for the pair of inlet valves and one for the exhaust valves which works by way of a split rocker arm loading both of the exhaust valves to allow the spent gases to escape. Valve adjustment is simple and is accessed by way of covers similar to those seen on the ‘83/’84 XR 250. The dual-radiator liquid cooling system appeared to work very well but it must be said that the environment we were testing in was far from hot. I did have the 650 spit some coolant out of the overflow after idling for sometime but I feel that this was due to the system being slightly over-full as it never happened again. The 1.4 litre dry-sump lubrication system uses the frame as the external oil reservoir. A reed-valve type system opens to allow excess oil from the crankcase to flow through to the gearbox.The gearbox is a gem; upshifts or downshifts are always smooth and easy. The clutch material is changed from the 600 and has good feel through the lever. I stopped with a bad leg cramp halfway up a particularly rocky and steep hill, the bottom end pull of the donk combined with the good feel from the clutch made getting going again a bit easier than I had expected. One slip, and I was faced with a very long tumble back down to the bottom, more than enough encouragement to ensure I made it. The smooth drive train transfers very little in the way of vibes to the rider. On the standard gearing (15/41) a genuine 188kph was seen on the radar gun. For this test we opted for 15/50 gearing due to the nature of the terrain. 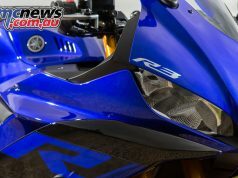 14 teeth front sprockets were not yet available for the new XR in Australia. Use of the large 50 teeth rear sprocket necessitates either adding links to the standard chain or replacing the chain with a longer 112-link itemChain adjustment is no longer by way of snail-cam adjustment but by the regular road bike system. Hard chargers have been known to bend the snail cam adjusters on previous XRs. The rear axle nut is now up to 27mm (same as ’99 CR) from the previous models 24mm. The chain guide is also improved to prevent excessive side movement. This should ensure the chain & sprockets have improved longevity.The bikes come with IRC TR8 tyres as standard fitment but we had medium-hard terrain Dunlop 739s mounted on the fairly robust alloy rims. The front light, light surround, brake line, master cylinder, caliper and disc are all lifted straight from the incredibly popular XR400. A headlight protector is a must. Feel from the 240mm front brake is okay but the hard-core fraternity will want to fit a stronger brake line. The reinforced front brake line from the later model XR600s will bolt straight on. The 240mm-rear brake is strong and has quite good feel. Stephen Greenfield, Australian Safari winner and twice Finke Desert Race winner, was along during the test and I used his comments to help me judge the suspension.He thought the suspension to be much improved over the XR600. The action is more progressive with much more adjustment available to those riders who genuinely know how to set up a bike. I thought the 46mm cartridge forks worked great on the bumps.The rear suspension has 308mm of travel and works well with a CR derived linkage ratio that is much improved over the XR600 set-up. Really serious guys will probably want to firm up both ends for racing but the fast guys we had along only managed to bottom the XR on a couple of occasions. I never bottomed it out and had the sag at around 30mm. I did experience quite a bit of front wheel deflection over the rocky stuff however. This is probably due to geometry rather than fork action and really fast guys probably won’t notice it at all. Riders who like to dig the front end in hard will probably drop the forks 10mm through the clamps. The frame is of a single backbone semi-double-cradle design and appears to be ultra strong. It weighs in around 5 kilos heavier than that of the XR600. Of course the extra weight of the frame is offset by the loss of a lot of weight from other areas. The bike weighs in around 136 kilograms dry with all road gear. The switchgear is standard road/trail fare and works well. Instrumentation consists of a small speedo with tripmeter and odometer with a light for the indicator and high beam. We didn’t get a chance to try and prove the effectiveness of the headlight, but we know the XR400 unit is pretty woeful and the 650 employs the same unit. This won’t be too much of a problem as more than half of XRs sold are never ridden on the road.Front indicator removal is necessitated by removing the top triple clamp bolts and unplugging the wires from behind the headlight. The sub frame can be removed with 2 Allen bolts each side and 1 in the rear guard. The rear indicators unplug from under the seat. It should be noted that 2 holes are now in the rear guard next to the airbox intake area. These holes should be sealed to reduce the chance of foreign objects entering the airbox. The better solution may be to replace the rear guard with a US ‘A Type’ guard. (P/N 80200-MBN-670ZA). Of course with the indicators etc. no longer fitted the bike is no longer legal to be ridden on the road. As standard the taillight on top of the rear guard is not operational. By obtaining the US ‘A-Type’ globe holder and globe this light operates as a taillight that is suitable for enduro use. The bike comes with a skidpan constructed of high-impact resin, which proved to be much stronger than it appeared. Enduro riders will want to add another piece to the to the top of the pan near the bottom radiator hose as this is somewhat vulnerable. Of course for ultimate protection the after-market suppliers will soon have tough aluminium bash plates available. The seat is reasonably comfortable for this style of bike, it is also easy to move about on. The XR was of course nice and easy to mono but it surprised me how easy it is to keep the front wheel on the deck if you need to, like uphill sections for example. The bike also hooked up incredibly well. All considered the XR650 looks to be a fantastic trail or enduro bike for riders of all skill levels. Unlike some of the more hard-core European competition it doesn’t demand to be ridden hard in order for it to work. This means that the XR650 is just as happy tootling along (as I do) or being thrashed senseless through hard terrain. The $9,990 + ORC asking price seems quite reasonable when stacked up next to the competition. 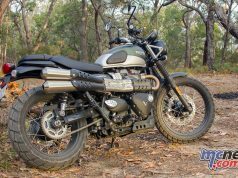 The XR600 replacement has been a long time coming but it seems to have been worth the wait. Suspension – rear Pro-Link with adjustable compression/rebound damping and 308mm of axle travel.